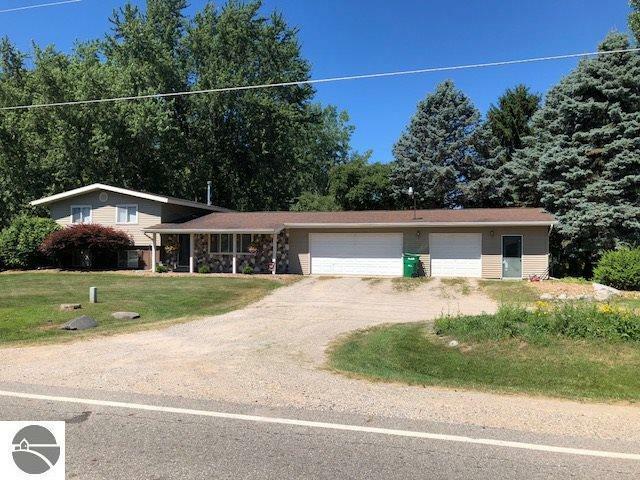 This 3 bedroom, 2 bath house is perfectly located just outside of town and is situated on just over an acre of land. With over 1800 square feet, lots of storage and a 3 car garage, it's perfect for anyone looking for space and location. The 3rd car garage is heated and insulated and would make a great shop of any kind, or just extra storage or for your vehicle. There have been many recent updates, including new flooring in the lower level, a completely updated bathroom and an updated kitchen with newer appliances. Storage is not an issue with this property. Besides the 3 car garage, there is a large shed, plenty of closet space, including a walk-in closet in the master, a large laundry room with shelving and built in shelving in the garage. Other updates include a new water heater, new sump pumps and water softener. There are two living rooms areas, one with a vent-less gas fireplace and the backyard is naturally secluded, providing excellent privacy and shade. MEASUREMENTS ARE APPROXIMATE. The accuracy of all information, regardless of source, is not guaranteed or warranted. All information should be independently verified. Copyright © Northern Great Lakes REALTORS® MLS. All Rights Reserved. Information last updated on 2019-04-21.